14 April: A WA woman has appeared in court charged with squirting a policewoman with her breast milk. Erica Stefanie Leeder, 26, faced Perth Magistrates Court on Tuesday accused of assaulting the female officer while she was being strip searched at Rockingham police station. It has been alleged that while she was undergoing the examination she grabbed her own breast and squirted milk on to the officer’s forehead, arms and clothing. She was charged with assaulting a police officer and appeared in court on Match 31 where she was refused bail on the grounds she needed to show exceptional circumstances. 6 October: It’s customary for the Prime Minister of Australia to appear at a Grand Final game to congratulate players. But things took an unexpected turn for PM Tony Abbott after last night’s NRL match between champions South Sydney Rabbitohs and the Canterbury Bulldogs. As the Prime Minister was introduced in the post-game ceremony, the crowd quickly reacted with a tremendous chorus of boos, obviously unimpressed with his presence. 6 October: After their team’s loss in the NRL grand final thousands of supporters spilled on to Burwood Rd in Belmore. The situation became tense when a pedestrian sign was ripped out of the ground. Fans jumped up and down on the sign when police forced their way through the crowd. A female police officer was seen confronting one man. As about 15 officers surrounded the area, the crowd started chanting “F. k the police, f. k the police”. Officers put their backs to the wall of a restaurant as the fans moved face-to-face with them. The officers took one person’s details and eventually left. No arrests were made. 15 April: The riot squad has been called to a Sydney courtroom to deal with a brawl between police and members of a family facing charges for assaulting police. Five members of the Mehanna family were facing Downing Centre Local Court in central Sydney over charges of affray and assaulting police on New Year’s Day in 2013 at their Bankstown home. Witnesses said that shortly after the lunch adjournment one of the Mehanna brothers struck a police officer, starting a courtroom brawl that involved more than 30 officers. 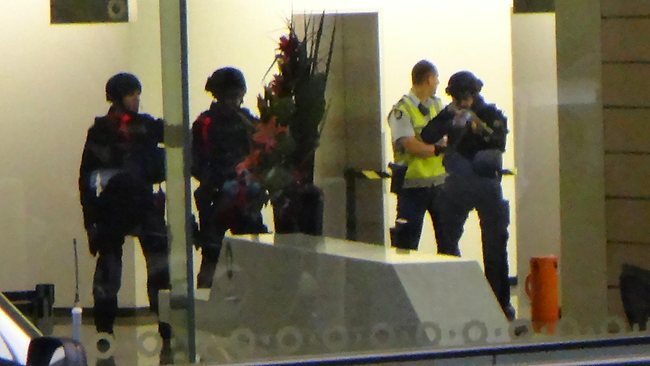 5 August: A man has been taken into custody after dousing himself with petrol in the foyer of a CBD building. The man, who was in the foyer of the Casselden Place building, which houses the Department of Immigration and Citizenship and the Australian Tax Office, had been speaking with police negotiators before he was arrested about 5.40pm today. It is believed he was protesting a government department within the building at the corner of Lonsdale and Spring streets. Witness Andrew Marshall said he saw a translator frantically trying to calm the man, just before a CriticalIRT officer raised his weapon. May 16: An Australian politician taking his morning jog through the capital has been attacked by a kangaroo. Shane Rattenbury, a minister in the Australian Capital Territory government that administers Canberra, said he was jogging along the pavement in suburban Ainslie when he almost collided with an eastern grey kangaroo that had been grazing on a front lawn. 13 November: Anti-royal protester Sam Bracanov says he was planning to throw a bucket of horse manure over Prince Charles and his wife Camilla before he was arrested on Monday. Bracanov, 76, pleaded not guilty when he appeared in Auckland District Court on Tuesday to a charge of preparing to commit an assault on the royal couple. Speaking while he sat on an upturned rubbish bin outside court after his appearance, Bracanov told media of his unusual protest plan.